That day was not going as I had expected. I was panicked. I woke up that Saturday morning with a long list of unfinished items I was determined to finish by the end of the weekend. The real estate crisis had twisted my ordinary life into unordinary chaos. It was like kudzu vines had invaded my yard and were slowly cresting the rooftop of my home–out of control. I ended everyday substantially cutting them back only to awake the next day to see the vines enveloping my life again. Chaos was now routine. The crisis was just beginning. I was watching the green monster grow out of control from the seeds of greed planted years before. “Where’s my Blackberry?” I asked vainly as exasperation heat ed my breath. “Remain calm,” I coaxed myself. “Remain calm,” I repeated to myself knowing desperation was filling my thoughts as I searched the house for my business pacifier, my connection to the world, my Blackberry. “No sir. You probably left it in your car,” never turning her attention away from the TV. I expected her response. She said it as matter-of factly as someone who had watched me endure this agony before until I did indeed declare that it was left in my car. “Good idea,” I thought, even though I had shuffled through the empty water bottles, fast food bags, forgotten papers and dirty hunting clothes that littered my car already twice that morning. “Maybe it fell under the seats,” I reiterated hopefully as I rubbed the scruff on my chin knowing I had already scraped through the debris under my seats. I had expected it to be there but it wasn’t. I headed back down to the garage to look again anyway. “It very well could be there,” I thought to myself. It was not in the car and I knew it, but my expectations sent me on the fruitless errand anyway. I shuffled through the mess again. No luck. Dejected, I walked back into the house. “Where could it be?” my fingers whispered through my tangled Saturday morning hair. I was possessed with the feeling that I had to find it. I had stopped even caring why. The point had now become finding it. Walking through the house, I met my middle child in the game room. She was also watching cartoons, but a different one than that of my oldest and of course on a different TV. It reminded me of when I was a child. I couldn’t wake up for school, but I could wake up before the sun rose on every Saturday to watch cartoons before anyone else in the family could claim the one TV we had. Thankfully, we only had three channels to fight over, or we would have spent more time fighting for airtime than we did watching it. “Honey, have you seen my Blackberry,” my personality struggled with my frustration to put some sweetness in my conversation. I knew it was not their fault, but I was desperate. I needed my Blackberry like an alcoholic needed a drink. I did not realize my addiction was impacting those around me. They don’t call it a Crackberry for nothing. She looked up immediately, feeling my tension, “I don’t know where it is, but I will help you find it. Like you always say, daddy, I am your good luck charm.” I could see through her green-blue eyes the sympathy she felt for me. My good luck charm, as I like to call her, is also blessed with a deep ribbon of sympathy and concern that runs through the granite of her serious personality like a vein of gold, rich and rewarding once accessed, but hard to access. My desperation and dejection had accessed it. She jumped up and put her arm around my waist, “let’s go ask Finch. He might know. Remember when . . .” I interrupted her immediately. “Don’t even say it,” I smiled firmly, slamming the door shut on her thoughts. I was swallowing my panic like a dry ball of bread stuck in my parched throat and I had no water to wash it down. She looked up at me reassuringly again wanting to remind me. I interrupted before she could even speak, “Don’t even think it honey.” My fearfully frustrated thoughts vibrated my speech to a quiver. We went to my room where my third child was watching his cartoons on another TV. I could not help but remember the time when I was his age and my brother and I had knocked the family TV off its stand while we were wrestling, cracking the screen. My dad was furious. Next to our house and our car, it was the most expensive thing we owned. He set the TV back on its stand and turned it on. We hoped more than anything we would see that familiar grey line across the middle of the screen swell in a flash into a picture when he turned it on. Nothing. Just a black screen. We were worried. My brother and I looked at each other. I could see in his eyes what he was thinking and he could see in mine what I was thinking. It was the same. “What’s he gonna do?,” our eyes said to one another, not daring to look up at him. “Ah, my favorite show, ‘All in the Family,’” he said as he walked back to his old green leather chair, the only chair in that room I ever saw him sit in. “I love this show,” he said enthusiastically through his grimace. My brother and I looked at each other even more afraid. The screen was black. “Sit back boys, you’re too close to see the TV. I love this show,” he said convincingly again through his grimace. We looked at the screen. Nothing. We looked at each other, then back up to the screen. Nothing. Our wide eyes revealed deep concern to one another. Everything was the same. It was as if the TV wasn’t broken. My brother and I even started to wonder if he really could see the TV when we couldn’t. We did not dare to ask. Once we finished dinner, the family would go into the living room, sit together as a family and watch a blank screen as my dad commented on the show as if it were on, “I love Archie. Now he is a real man,” he would say with a chuckle. We never said a word. We stared at that screen and pretended to watch the news, “Hogan’s Heroes” and “All in the Family.” After a while, we even started to laugh as if something funny had happened on the show. He laughed too. “Here we go again,” my brother’s eyes and mine said with a glance. I watched exasperatedly as my brother walked to the TV and turned it on. Surprised out of my boredom, the little white line appeared across the middle of the screen. I looked at my brother, our eyes said “what?” The white line popped into a picture and Edith Bunker’s scratchy, yankee voice pierced the air, “. . . guys like us we had it made, boy those were the days . . .” Life was back to normal. Nothing was ever said. We were not expecting that. We got lucky. “When I was your age I once spent a month staring at a blank screen,” I tried to make point to them without any reference. My daughter replied, “What?” My son never looked up. He was lost in the Justice League with Batman and Superman. “Never mind. Have you seen my Blackberry?” I asked him as calmly as I could muster. I could feel the furry vines of the Kudzu tightening around my chest as I waited for his answer. “No sir,” he said reflexively as he stared blankly rapted by the television. “OK,” I thought. “Why should he care?” “He’s only five – way too young to see the Kudzu taking over my life.” I rubbed my Saturday morning scruffy chin trying to coax my mouth to speak calmly. “Are you sure you haven’t seen my Blackberry?” I asked again more seriously battling hard to unwrap the Kudzu consuming me. I was trying even harder not to reveal my struggle to them. “Daddy, what’s a Blackberry?” he asked not looking away from the cartoon droning on in his foreground and my background. “My phone?” I aguishly inquired. “Oh, your phone,” he stared up at me hopefully as he turned away from his cartoons for the first time. His eyes smiled up at me brightly twinkling their natural mischievousness. Trouble sparkled so brightly in his eyes it reminded me of the details of the moment I was trying to forget. My stress melted into internal laughter and happiness. With that look, the Kudzu unwrapped me from its hold and receded from my bedroom. I felt it wither down the side of my home and slide down the front lawn. Bad memories with children have a way of morphing into happy thoughts, funny stories and wedding video clips over time. I felt my daughter wrap her arms around my legs replacing the cold, heartless Kudzu with the warmth of her body and the glow of his expression as the two of them whisked me back in a hazy daydream two years earlier. I was gripped with the same panic of losing my link to the World. I could see him just as he was, standing at the end of the hallway barely inside the open door. He looked up at me with the same fearless gleam glowing in his eyes. From behind overgrown, un-kept blond strands, his boyish glare transcended trouble dealt without intent. “Bye-Bye pone,” he said as he tugged over and over on the lever of the toilet. “Bye-Bye pone.” I saw it like it was happening again. I could feel the rumble of my laughter swelling through my desperate scream, “Noooooo.” It was too bad to be funny and too funny to be bad. The instant of that memory cut back the weeds of my life outside my home and filled me with the hope of the life inside it. I found myself thinking about what had just transpired. I had been wandering around my house aimlessly searching for an electronic device which if I could admit it, I truly didn’t want to find. I was bumping into my kids as they lost themselves in electronic devices I wish they hadn’t found. I laughed as I reached down to pick my daughter up. I hugged her and decided to put an end to the expected that day, “Thanks lucky charm. 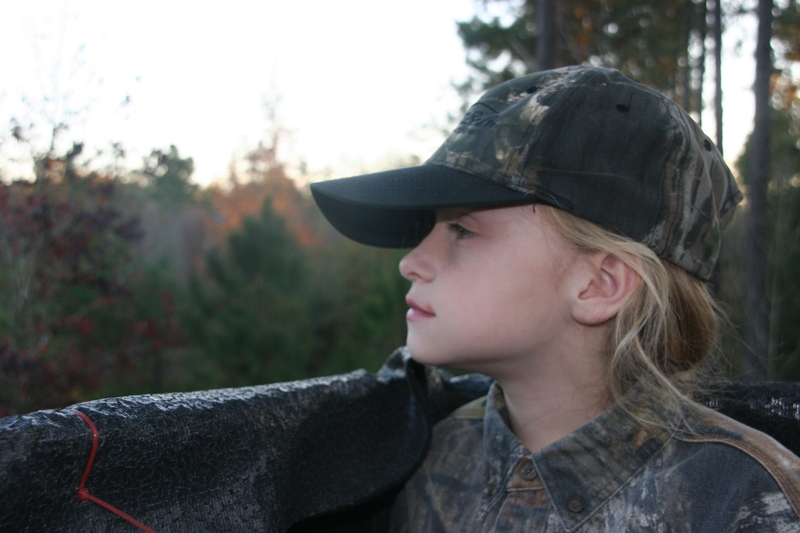 Lets go hunting,” I looked her in the eyes trying to imagine what she was thinking. “But you didn’t find your phone,” her voice promised to continue helping me on my quest. “How can I be a lucky charm if you didn’t find your phone?” she asked quietly. “Addie, you’re my lucky charm. Trust me, you’re my lucky charm,” I reassured her and myself. “Let’s go out to the hunting property and try to use up some more of your luck.” I hugged her and hoisted her down to the floor. “OK, but I still don’t think I am that lucky if I didn’t find your phone,” she said as she shrugged her nonchalantly confused shoulders. “Luck has nothing to do with getting what you want. Luck is about experiencing the unexpected,” I hoped she understood but knew she probably didn’t. “You are the luckiest person I know Addie because you never expect anything,” I reassured her. “Thanks, daddy,” she said as if she understood completely what I meant but satisfied in the knowledge that I thought her lucky. I watched her intermittently in my rear view mirror thinking deeply about what I had just said. She was staring out of her window with her chin resting on her hand, nodding her head contemplatively as the scenery of the country drive flashed past us. I could see that rich vein of gold deep beneath her granite. I could also tell that she was thinking about that phone. She had watched me searching the house for it as if I had lost one of my children. After we had been riding in silence for about twenty minutes, she asked “If you didn’t care if you found your phone, why were you looking for it so hard? You sure seemed like you wanted to find it,” she belied her confusion. The simple logic of her question paused me for a minute, “Well, I need it for work and I did want to find it but …” I paused. I couldn’t explain it because I didn’t know the answer myself. “Why do you work so much?” The question cut me to the bone. I had always naively hoped I could make work opaque to my kids, that I could be a big enough part of their lives that they wouldn’t even notice I was working. In fact, I had given up a career knowing that it would not give me the time I wanted and needed for my children, only to realize a few years later my new career was not much different. Careers and children are repellent. Even though I knew it was not completely true when I said it, I replied, “Honey I only work to make money so we can pay for our house and all the things we need.” The fact was that I didn’t really understand myself why I worked so much. “We sure must be rich,” she said as several grazing horses blurred past her window. Her innocent words slapped my heart. I was startled by her quizzical reply and looked up in my mirror instinctively. “We’re not rich,” Honey. “What makes you think that?” I asked with an uncomfortable chuckle. I could feel the Kudzu constricting my breath, swarming back up through my yard, reaching over the top of my home and wrapping its tentacles around my chest. I did not know how to respond. “Well, I am rich because I have your sister and brother. I am rich because I have your mother. I am rich because I have you and I am going to spend the afternoon hunting with you,” my voice shook and mustered as much reassurance as my mind had. “If that makes us rich, then you do not need to work that much,” it was simple for her and it made sense for me. Again, I felt the constricting veins unwrap themselves from my chest and wither down my home and through the yard. As much as I did not want to believe it, I felt she meant to make the point: She had no expectations. I was truly lucky to have her.